Hybrid Computing Systems (HybriCS), previously known as SuperLinks, is a line of cluster products from HPC Links for all your hybrid and green supercomputing needs and can seamlessly scale from one blade to thousands of blades. Combining a set of power-optimized x86 as well as GPU hardware building blocks from Supermicro and Boston Ltd. with the trend setting VERTEX architecture and Open VERTEX 1.0 software platform from HPC Links, HybriCS is tailor-made for your most demanding HPC applications. Get the HybriCS solution sheet (PDF, about 900 KB). is a Hybrid HPC platform architecture where control nodes transparently connect light-weight, heterogeneous compute nodes to storage and system services. VERTEX addresses the challenges posed by today's Hybrid HPC systems that use traditional CPUs as well as compute intensive processors such as GPGPUs, many-core, and Cell processors on the same HPC system. 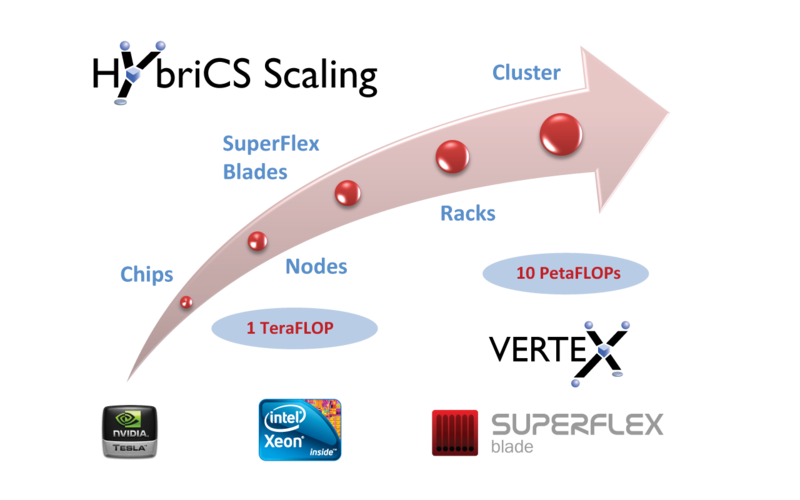 By employing a set of unique features, VERTEX provides unprecedented levels of ease-of-use, flexibility and scalability for commodity hybrid HPC systems. HybriCS also deploys scalable Linux OS and system management as well as scalable Microsoft Windows HPC Server environments (without VERTEX).